Every September, as New Student Orientation winds down, Georgetown undergraduates receive words of caution in their inboxes. An email, this year from Dean of Students Jeanne Lord, tells students that the university does not endorse social fraternities and sororities because Greek life violates some of the university’s values. Nationally, Greek life is on the defensive. At large state universities and elite private colleges alike, administrators are seeking to rein in Greek organizations that have been accused in recent years of ritually hazing recruits and abusing alcohol. Academic studies have shown that members of fraternities are three times more likely to commit sexual assault than non-members. At the University of Michigan, Greek life’s own student-run supervisory board banned many of the parties and other social events the organizations are known for putting on. Florida State University went even further. After a student died during a fraternity hazing ritual, the administration banned all Greek organizations’ events. Fraternities can no longer hold the large parties that characterized their existence at Florida State. About 10 percent of Georgetown students participate in Greek life, according to GUSA’s website. For the most part, the organizations have no dedicated houses, and students have other parties to go to. As a result, Greek life can be something of an afterthought at a school with a legendary “club culture” in a city with a vibrant bar scene. Members of fraternities and sororities are now trying to navigate the tension between Greek life’s national reputation and the tamer existence the groups have on campus. Asher Curnutte (COL ’21) grew up in Nashville, Tennessee, around the kinds of fraternities that have sparked the national conversation around Greek life. At football games and pre-game tailgates, he said, he was accustomed to seeing Greek letters. 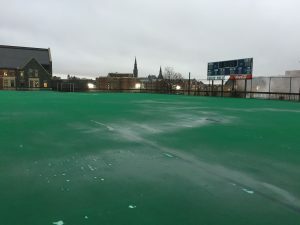 But Georgetown’s fraternities were not on his radar when he arrived on campus last year. He said he did not even know they existed at Georgetown until he saw a flyer on campus. Sigma Phi Epsilon (SigEp) was among the clubs he signed up for in the first few weeks of school, but he didn’t make it through that fall’s recruitment—or “rush”—cycle. But for Curnutte and the other members of Georgetown’s Greek system, only a part of their lives is Greek. Ryan has found that being a part of Kappa Kappa Gamma does not mean that she is split off from the rest of the campus community. Like many of her sorority sisters, Ryan said, she has a part-time job off campus and is involved with several on-campus groups. 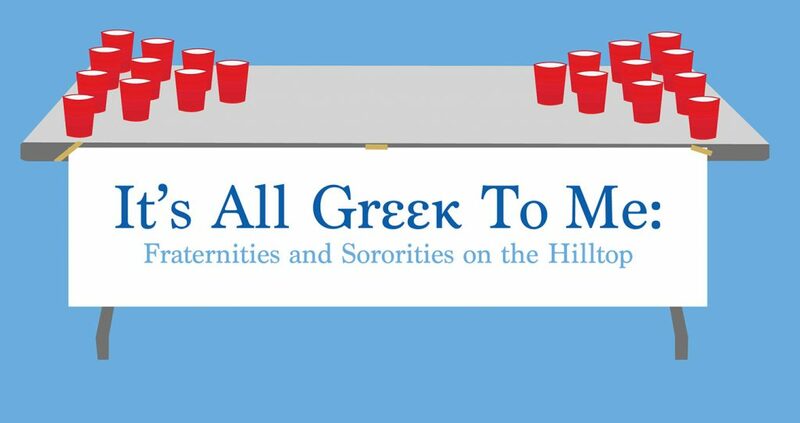 Despite their defenses of Greek life, each member that the Voice interviewed acknowledged that fraternities and sororities can be exclusive to some students. There are explicit financial barriers to joining a Greek organization. In SigEp, brothers spend hundreds of dollars on dues and other costs every semester, and only a limited number of scholarships are available to cover them. And because of the fraternity’s membership, which skews white and well-off, students who do not fit that description can find the group intimidating or exclusive. Curnutte said that the university’s refusal to recognize Greek organizations contributes to the group’s homogeneity. They could recruit more effectively and find a more diverse group of new members if they had access to the benefits the university offers groups it recognizes, he argued. Josiah Laney (SFS ’21), another member of SigEp, put it more bluntly. Laney acknowledged that problem is not easy to address. He has also tried to convince the group to lower the costs associated with being a member of SigEp. After the group’s mandatory weekly chapter meetings, many members of the frat go out to dinner in small groups. Laney said he has tried to change that tradition to encourage upperclassmen to cook dinner for their brothers. Opponents argue, though, that the deeper problem with social fraternities is the environment they foster which permits sexual assault. Georgetown’s annual email says the university’s non-recognition of Greek life partially stems from the groups’ alleged participation in “high-risk behavior” like alcohol abuse and hazing. But the email does not specifically mention the sexual assault which pervades Greek life nationally. Georgetown is no oasis free from sexual misconduct, and the SigEp brothers know that. They said their chapter has brought in outside resources to help train its members to recognize and defuse potential instances of sexual assault. Nonetheless, Laney said that SigEp has done a good job—better, he thought, than other fraternities on campus—in taking initial steps to address sexual assault. In the future, Laney wants the group to plan its response if a brother is suspected of committing a sexual assault or if there is a risk one might. He listed some other ideas: monitoring party attendees more closely, creating a way to report suspected assaults, and improving the disciplinary process for members who are suspected of committing assaults. Like Laney, Ryan did not acquit Georgetown’s Greek organizations of the faults of Greek organizations nationally. But she suggested that other campus organizations had similar issues as well. “I think it’s unfair,” she said. Ryan said that she has heard people in other, university-recognized groups describe the experiences—hazing and sexual assault—that prompt the university’s refusal to recognize Greek organizations. “They need to take a step back and look at all these other organizations where that’s happening,” Ryan said. For some members, the benefits of Georgetown’s social Greek life outweigh the risks. Caitland Love (COL ’21) started college sure that Greek life was not for her. She grew up in Texas surrounded by stories that cast Greek life as a bastion of sexual assault and alcohol abuse. High school friends who went to big schools in Texas have encountered those things first-hand, she said. Growing up, she saw membership in sororities as an excuse to drink a lot, a holdover from a starkly different past. She did not consider rushing a sorority until a family member convinced her that there might be more to Greek life than she thought. Kappa Kappa Gamma, for instance, works with Reading is Fundamental, a children’s literacy organization. They also run events that try to inspire a tight community among the sorority’s members. When Love met the members of Kappa Kappa Gamma and saw they do more than go to parties, she changed her mind. Still, Love said that the group is aware of the risks associated with a Greek social life. Love said that her sorority does more than host and attend mixers with other Greek organizations. Careful not to cast aspersions, she was conscious of the risks fraternities and sororities present, even on Georgetown’s campus, where fraternities are less influential than at other schools. Her experience at Georgetown has not changed her view of Greek life in general, either. Addressing Georgetown students who might compare Greek organizations at Georgetown with those at other schools, Love wondered whether they have really met her or her sisters. Like Love, Curnutte said that being in SigEp is not the largest part of his identity. But he is more forthright about his membership. “I proudly tell people I’m a part of SigEp,” he said. He is proud of what they accomplish—philanthropically, personally—and of who the members are as people. Jack Townsend Jack is the Voice's features editor (and de facto website editor).